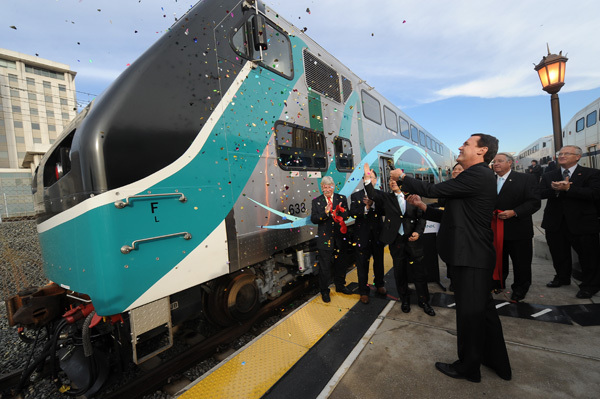 Metrolink Board Chairman Keith Millhouse showers the new safety-enhanced rail car with confetti as transit officials launch the first of Metrolink’s new Guardian fleet, which will eventually total 137 rail cars equipped with state-of-the-art safety technology. Also on board for the launch is, background from left, Metro’s CEO Art Leahy, Director Richard Katz, Republic of Korea Consul General Jae Soo Kim, Hyundai Rotem Co. President Minho Lee, MTA Chairman and L.A. County Supervisor Don Knabe and Metrolink CEO John Fenton. Photo by Gary Leonard. Metrolink publicly debuted its first Hyundai Rotem railcars at Union Station this morning. The cars are equipped with crash absorption technology. The agency has ordered 137 of the cars to be part of its “Guardian” fleet. In addition, and as a response to the deadly Metrolink crash of Sept. 2008, the agency recently awarded a contract to implement a positive train control system that uses GPS technology to monitor of trains across the five-county Metrolink system and to keep them at safe distances from one another. Is there more space for bicycles in each car? @Michele: Actually, I think there is less room for bikes on these cars. The area reserved is now the transverse area under the stairs, (so about 2/3rds of the car width) opposite the restroom. Securing the bike is now done with a wall-mounted seatbelt just like many bus wheelchair spots. All of the seats in the cab car face away from the cab, so when the train is being led with the cab, one will sit backwards if one rides in the cab-car. There is also a noticeable lack of knee-room, and I was disappointed to see so few power outlets. Why can’t they be a each seat-pair? I also suspect that some larger customers will have problems with the width of the seats as well as the “tummy-room” between the seat and the tables (at those seats that have tables) is less than on the Bombardier cars. Finally the flush button in the restroom looks like an emergency stop. Be prepared for un-flushed bowls! @Erik G. – Thanks for sharing about the diminished bike space (and other space) in the new cars. I guess I can check it out when they start on the Antelope Valley line. It’s amazing that to solve the problem of trains crashing into each other we have to build trains that crash better. It’s like when the first George Bush decided instead of cleaning our rivers to save the fish, we will genetically alter the fish to be tolerant of the chemicals. These trains ride on metal tracks – we have GPS – how hard is it for two trains to be notified that they are on the same track and heading toward each other? The solutions (besides these new crash friendly cars) should not have to cost millions of dollars. Lojack tracks my car – why can’t they track a train? The Metrolink Board this fall approved a contract for a positive train control system — essentially a system that uses GPS technology to track the movement of trains and to prevent them from colliding. Unfortunately, trains do sometimes collide with things other than trains (namely, vehicles) and I think it’s reasonable to make the train cars as safe as possible in case of any type of accident. With all due respect, I think this is a good investment on many levels by Metro. I think that if we are willing to spend the money on metrolink to make it more crash-safe, then we also ought to be looking more at metrolink in general from a systems perspective and how we can improve its overall service. One thing that would make the system safer would be do double track the system. Besides increasing the head ways, frequency and speed restrictions, and overall efficiency, this would severely decrease the chance of a train to train collision. There are many other radial commuter rail systems that have most or all of their lines double-tracked (METRA Chicago, MBTA boston, SEPTA Philidelpha, GO TRAIN toronto just to name some. )Our metro area in population is as large or larger than the areas mentioned. This is the best investment we can make in our already-established commuter rail network. Metrolink is very similar in its alignments to those other systems. So lets make the most use of it. My mistake in listing the GO train in Toronto as it actually does have very limited service. I have read that the positive train control system will cost $100 million dollars!!! Are kidding me??? Seriously?? To track a train? This is the kind of absurd government spending people are so sick of. When off-the shelf technology can be used right now (and should have been used all along). An iPhone has GPS and an App (probably free) that will locate it if you lose it. Did you read the story about the father and son who launched an iPhone in a weather balloon – and how much it would have cost the government if they had done the same experiment? What is the disconnect? Why are governmental agencies so slow to recognize a problem, so slow to address a problem and so eager to overspend on a problem when the time finally comes to fix it? I’m sure this $100 system will take years to install – can we at least use a simple off-the-shelf system in the meantime? No one else should get hurt from this preventable problem. No, we’re not kidding you. It’s an expensive system. And while I understand that everyone has the right to be concerned about government spending, I would respectfully suggest that an iPhone app is a very different thing from a GPS-based system that has to keep track of very busy train traffic across more than 500 miles of track in the five-county area — including numerous stretches of single track with trains traveling in both directions. Although positive train control is very expensive, I think it’s worth it in terms of the lives it has the potential to save, not to mention the far less important fiscal cost of an accident. I do not doubt that it is worth it. All that I ask is whether other, more cost realistic approaches were considered. Marine radios have a system that identifies who you are and what kind of vessel you are and your direction/speed of travel – this information is then available to all in range with an AIS-equipped chart plotter. You can get a complete system for less than a grand. Now I don’t know if this would work for trains – since VHF relies on line-of-sight to communicate but it is an example of off-the-shelf technology that could help. If the engineer could simply see what other trains are around (not the whole 500 miles – just in the vicinity)- this would be a huge step towards reducing collisions. And as far as I know, this has never been addressed. Positive train control is complicated and elaborate. It will apply the brakes for the engineer, I believe. So the first step we are taking to solve the problem is costly, complicated and will take years to deploy. Commonsense dictates that we do what we can now, and not wait until the new system (which will have plenty of bugs to work out) is available. And crash-friendly trains do not address the cause of the problem, only the result. If there is an inexpensive way for engineers to know about surround train traffic, then that should be implemented asap (despite the predictable objections of the PTC contractor – since this would all but solve the problem).